One of the joys of chicken keeping is calling one’s hens and having them come running to you in that flapping, rolling, comical way that they have (like toddlers with full diapers.) Not only is it amusing to see chickens hurrying to you, but it is behavior that is essential to a well-managed poultry yard. There are many situations when it is essential to be able to have your flock hasten home, and to be easily closed up into a secure pen. The key to teaching your chickens to come is for them to see you as the font of all good things. First, they have to have no fear of you. Always work around them in a calm and confident manner. Take the time to sit on a low stool and be amongst them. Not all chickens like to be held, but most like to be around people, after all, they are curious animals, always looking for amusement. Just wearing a shirt with a bright pattern is enough to occupy their minds! They’ll see you caring for them daily, filling their feeder and waterer. They’ll know that a compost pail means good things to rummage through in their pen. When I garden, I save unearthed grubs and buckets of weeds for them. 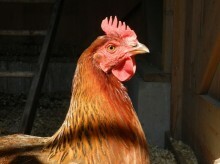 Soon enough, your hens will always be watching out to see if you have something good for them. But, to have them come in an excited horde when called takes a tad of training. Put something extra-special, like cracked corn or hulled sunflower seeds into a small container. Stand near the hens, shake the treats loudly and say, “here girls” (or “ladies” if that’s what you call them.) Toss a few treats at your feet. They’ll get the idea, quickly. Do this a few times. Then, you can try it a bit further away. In short order, when the hens hear you say, “here girls” they’ll come running, just as enthusiastically as mine do, as you can see in this video.